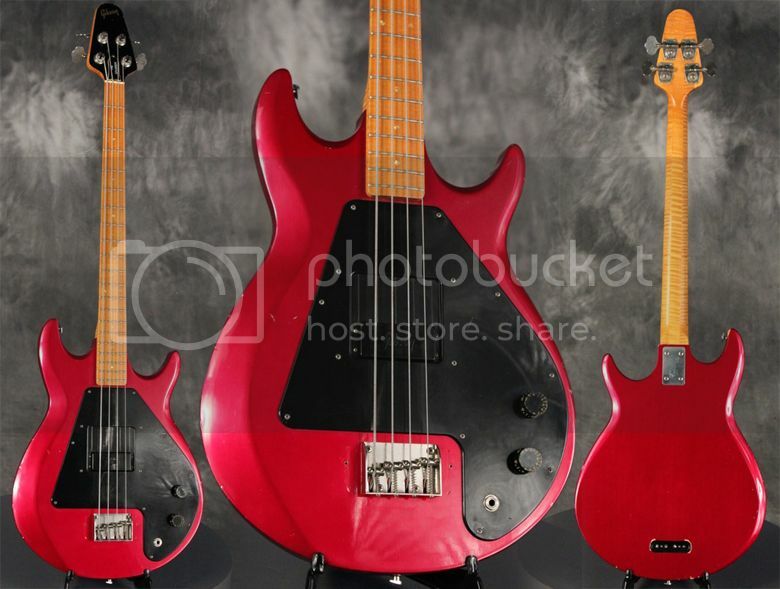 Guitar Blog: 1982 Gibson Grabber bass with the now legendary sliding pickup and in Candy Apple Red! 1982 Gibson Grabber bass with the now legendary sliding pickup and in Candy Apple Red! The Gibson Grabber was initially introduced in 1973 replacing the SG-styled EB0 as Gibson's entry-level bass guitar. It was a sibling to the Gibson Ripper bass, but differed in having a bolt-on neck with a Flying V-type headstock, simpler electronics and a single sliding pickup. The name "Grabber" refers to the pickup which can be grabbed by the player and repositioned so as to effect a tonal change. However, the pickup does not seem to have a lot of travel and a look "under the hood" (as it were) shows why. 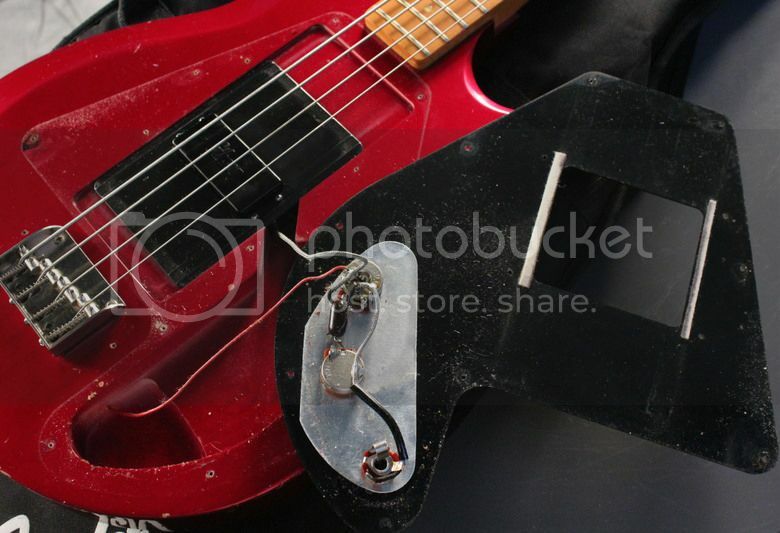 You'll see that the pickup is mounted on a plate beneath the main pickguard - I'm guessing ostensibly for aesthetic reasons so as not to reveal the cavity beneath, pickup wires, etc - but this means that the pickup movement is restricted by the space in which the much larger plate has to move. Nevertheless it is still a very interesting instrument. However, possibly the most interesting feature of the pictured example (currently listed on eBay with a Buy It Now price of $1,490) is the rarely seen Candy Apple Red finish. The Grabber was more commonly seen in Natural or Black finishes, but some examples were made in White and in "Wine Red" (which I believe this is - technically speaking, "Candy Apple Red" is actually a Fender name). This Gibson Grabber is from 1982 which was the penultimate year of the model's production, and which means that the body would have been made from Alder; earlier examples were much heavier being made from Maple. Grabbers and Rippers are incredibly cool and good sounding basses. I'd love to have one.